READ THIS FIRST BEFORE BUYING! S=38R, M=40R, L=42R, XL=44R. Please check the MYS size table here. DO NOT look at the Amazon size chart. Please make sure your body's chest circ is at least 2 inches smaller than the jacket's chest circ, and your body dimensions should be smaller than the jacket's dimensions in every aspect so that you have play room inside. If none of these sizes matches you, please choose "Tailored" and we will customize the suit for you. S/38R: Shoulder 18.0", Jacket Chest Circ 40.0", Jacket Waist Circ 35.0", Jacket Length 28.3", Sleeve Length 24.4", Pants Waist 34.0". M/40R: Shoulder 18.8", Jacket Chest Circ 42.0", Jacket Waist Circ 37.0", Jacket Length 29.1", Sleeve Length 25.0", Pants Waist 36.0". L/42R: Shoulder 19.5", Jacket Chest Circ 44.0", Jacket Waist Circ 39.0", Jacket Length 30.0", Sleeve Length 25.6", Pants Waist 38.0". XL/44R: Shoulder 20.3", Jacket Chest Circ 46.0", Jacket Waist Circ 41.0", Jacket Length 30.7", Sleeve Length 26.2", Pants Waist 40.0". 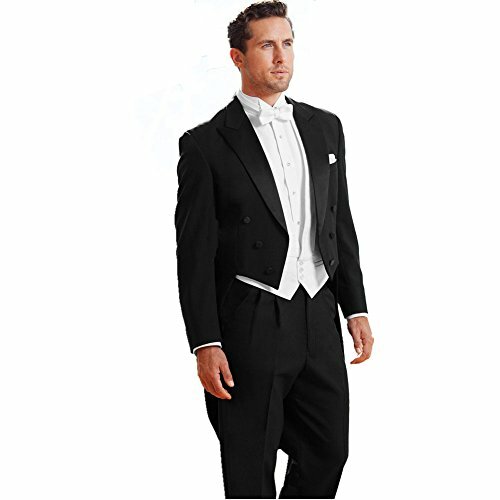 Ideal for an elegant, white tie wedding or event, the Classic Peak Full Dress tuxedo is tailored in a traditional six-button tailcoat style with formal satin peak lapel, satin-covered buttons and center vented tail. Pair with matching black pleated trousers, a white piqué vest and bow tie for a classic white tie ensemble. Jacket and pants are included. Vest and tie (if shown) are also included. Shirts are NOT included. The end of the pant legs are NOT hemmed yet. We do this so customers can adjust and find the best length of the legs and hem easily. S=38R, M=40R, L=42R, XL=44R. Please check the MYS SIZE TABLE in description. DO NOT look at the Amazon size chart. If you are not sure, we strongly suggest you choose "Tailored" for size. We will customize for you and it costs even less. Jacket, Pants, Vest and Tie included. Shirt NOT included. Thick and smooth fabric. Ideal suit for parties and ceremonies. Careful lining. Purely handmade by experienced tailors. MYS® is a registered trademark of Geek-House. Buy only from Geek-House. If you have any questions about this product by MY'S, contact us by completing and submitting the form below. If you are looking for a specif part number, please include it with your message.